Home » History » Profiles » Robert Andrew Love, Jr.
Robert Andrew (Andy) Love, Jr.
Andy Love was one of Cliffside’s best known figures in Cliffside during the 1930’s and early 40’s. He was R. R. Haynes’ grandson, a child of Sara Judith Haynes and Gastonia textile executive Robert Andrew Love, whose family founded Burlington Mills. 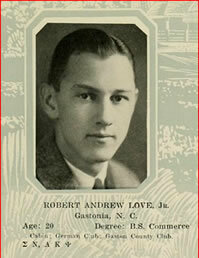 Raised in Gastonia, he graduated from UNC Chapel Hill in 1928 (with a BS in Commerce). Some notable classmates were future N. C. Governor, Dan K. Moore; Holt McPherson, future editor of The Shelby Daily Star; and Caesar Cone, rising prince of Cone Mills Corporation. Andy beside his beloved Buick. He arrived in Cliffside soon after, living in an apartment in the home of his uncle, Charles H. Haynes. He acquired and operated a store/soda shop in Avondale. In 1934, Andy took the exam for the position of postmaster of Cliffside, to succeed John L. Scruggs. (Morris Blanton served as acting postmaster for a few months.) 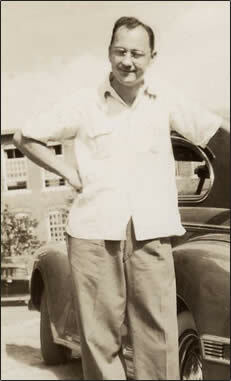 Andy successfully passed the exam and assumed that post on January 16, 1935. He hired Mr. and Mrs. Mal Proctor to come to Avondale and took over the soda shop’s operation, which included a wagon (called the Dope Wagon) that was loaded with soda pop, ready-made sandwiches, tobacco products, headache powders, candy etc. The Proctors (or their employee) pushed the wagon through Haynes Mill three times a day. In February 1942, having received his 1-A military classification (making him likely to be drafted into the army), Andy, then 36, volunteered for the Air Corps ground force. Things went well, he passed the necessary examinations and disposed of his beloved new Buick, bicycle, overcoat—he even sold his bed. Then he went to Spartanburg where he was to entrain for a Mississippi assignment, but in the meantime, Uncle Sam had determined that, just then, no more men were needed at his assigned air field. Disillusioned, Andy returned to Cliffside with no place to lay his weary head. Soon Private Love was reassigned, and in just a short time, this astonishing news arrived. Cliffside, Aug. 18—Word has just been received here that Private First Class Robert Andrew Love, former postmaster at Cliffside, and who volunteered his services at Morris Field, Charlotte, about eight months ago has been commissioned a first lieutenant in the adjutant general’s department, effective August 15, 1942. This is a singular honor for Mr. Love considering the fact that he has only been in the service for a short time and is very young in years, and he was selected for this commission and recognition from a large group of men due to his experience in the postal work prior to entering the army, also to his apparent vigorous health, energy, tactfulness and business ability. Lieutenant Love has orders to report in Washington, D. C., August 23rd, and will probably be sent from there to some army base as postal officer. This commission came to Mr. Love as a complete surprise, he not having had to attend an officer’s candidate school. After the war, when Andy came home, the Proctors were getting up in age and wanted to retire, so Andy sold the store to my neighbor Bate Morehead and relocated to Shelby. He moved into an apartment in a hotel across the street from the County Courthouse, and started a company in that financed cars, a big business after the war. He also had a wrecking (junk) yard over on East Marion Street, across the highway from the old Nehi Bottling Works. Andy never married as far as I know. Andy died in 1964 at age 57. He is buried in the Haynes section of Cliffside Cemetery, along with his mother and sister, Virginia May. This article originally appeared in the Fall 2013 issue of The Cliffside Chimes, the Cliffside Historical Society newsletter.